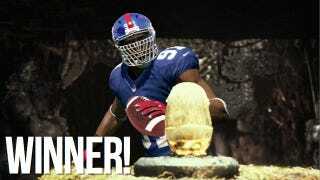 Justin Tuck's unfacemaskable facemask? It's in the game. It's in a lot of other things, too, thanks to last week's photoshop and overall winner BigMike McCarthy! Last week I asked you guys to morph, swap or photobomb something with Tuck's grill, and you responded with verve. Notable submissions include Nude_Eskimo (7—look, he even matched up the jumbo-tron screen in the background) uscg_pa (18) and PrinceofPwng (9) with timely Bane-themed shops. For the best of the Silence of the Lambs submissions, it's Sticksabbi (14) and a beauty. toolsoldier (17) delivered an awesome last minute entry. For my money, BigMike's the best overall. Hell, maybe Indiana Jones should have worn that kind of a helmet when he went to raid the Hovitos' temple. Couldn't hurt. Thanks to everyone who entered; we'll be back tomorrow with another 'Shop Contest subject.